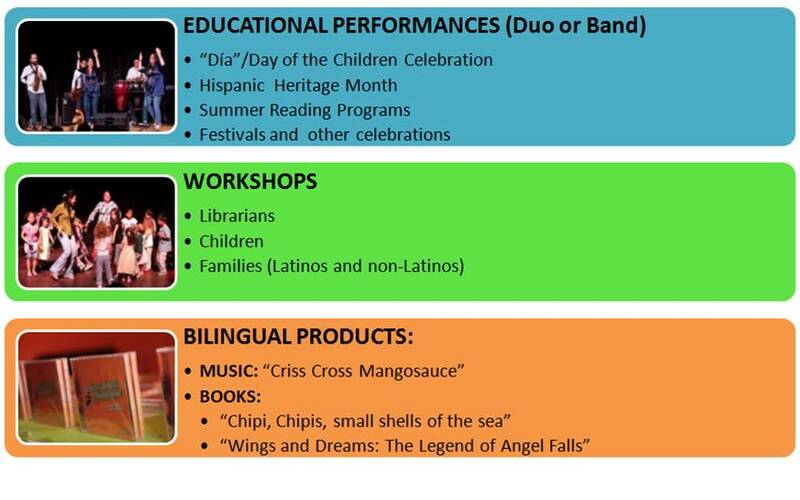 Criss Cross Mangosauce, LLC offers several programs to libraries interested in offering authentic multicultural programming for patrons. Our innovative programs help libraries connecting with Hispanic/Latino children and families in meaningful and culturally relevant ways. Most recently, we produced a staff training video for the Collaborative Summer Library Program called Storytime Techniques. Any Language. Any Community. In this video, we showcase our bilingual techniques as we understand that English is not the primary language of all stortytime participants or their caregivers. Also we know that English-speaking caregivers often want to expand their young charges view of the world and vocabulary with words or songs from other cultures in other languages. Authentic arts-based programs in story times can be critical in nurturing the linguistic, cultural, and cognitive strengths of mainstream children as well as those with developmental challenges or those children labeled as English Language Learners (ELLs). An arts-based approach offers a way to bridge linguistic differences among children, educators and families by recognizing the full range of human potential for expression and understanding. Provide innovative artistic programs based on multicultural themes meeting the educational needs of the diverse communities in the US. Provide multicultural training/workshops for librarians, parents and other adults to increase cross-cultural understanding as well as the development of language, motor and literacy skills. Assist librarians, parents and other adults in the selection, acquisition and use of books and other educational materials in Spanish (or bilingual) for children. Encourage / support research on multicultural programs for young children. Why is this concept important for Libraries? There is a growing need for bi-cultural educational programs, considering the fast growth of the Hispanic population in the US. Hispanics constitute 15% of the nation’s total population. By 2015, the share of children of immigrants is projected to rise from 20 percent to 30 percent of the nation’s school population. There are few bilingual and bi-cultural resources available to meet the increasing need for this kind of programs in the US. There is a great connection between literacy, arts integration and language development.